He is completely sure that his theory is correct, and he is willing to go to great lengths to defend it, no matter how outrageous it is. He doesn’t care how outrageous others may think that his theory is, and he will present it anyway. He is desperate, and can think of no other theory to explain the problem at hand. Essentially, Dr. Benner and FFAME are intimately involved in exploring how life could have arisen on earth spontaneously from a random mixture of chemicals, lightning strikes, and an occasional erupting volcano. Others have referred to this as a “primordial ooze”. 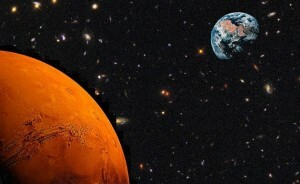 However, I do not believe that the most important point about his theory is that Mars was the original source of the of organic chemicals required for life on earth. Instead, what I find important is that Dr. Benner believes that it would have been impossible for these vital organic chemicals to have spontaneously formed in the earth’s environment. Thus, the out-of-this-world Mars hypothesis. No one knows how life started on Earth. No one witnessed the event. The Bible clearly states in Genesis 1 that God created the earth, the heavens, the sun and the moon, the stars, light, plants, animals, and man on the different days of Creation. However, many Christians, while professing faith in Jesus Christ as Savior, doubt the literal Creation account in Genesis, and instead believe that life could have evolved from scratch, from a primordial ooze, and subsequently evolved over millions of years. Dr. Benner is disputing this idea, stating instead that life must have come from outside of the earth. Many scientists believe that the earth has long been covered with water, and water is actually an inhospitable environment for organic chemicals to arise. “Most people think that water is essential for life. Very few people understand how corrosive water is”, Benner says. Scientists who believe that life started from scratch generally agree that RNA was the most vital compound to have originally, even before proteins. Water is extremely corrosive– to RNA, and bonds cannot be made within water, preventing long-strands from forming. RNA is similar to DNA, and is found in living cells and carries genetic information much like DNA does. However, proteins are formed directly from RNA rather than DNA in the cell. The problem of water being vital for life and yet preventing the formation of organic compounds is often referred to as the “Water Paradox”. Another paradox is the “Tar Paradox”. Essentially, when building blocks of organic molecules are assembled to together and energy is added to the system, such as from lightning, a gooey tar-like substance results. This tar is completely incompatible with the formation of life, and is more suitable for paving roads. In writing this article, I am not disputing the chemistry involved. But look at all of these historical assumptions that are made, including the past atmospheric composition of Mars and earth, the abundance of various elements which has not been verified, the amount of surface water of different planets in the past, and all of this just to create one molecule – ribose. Then, the ribose would have to be blasted off of the Martian surface by a volcano or meteor, make its way through the solar system to earth, descend through the earth’s atmosphere at incendiary speeds, crash onto the watery earth, and somehow exist in enough quantity to support the innumerable additional chemical reactions can then have to take place to make the building blocks of life. Unfortunately for the scientific community, it looks like life did not arise spontaneously from scratch on either Mars or earth – Dr. Benner has just proven that. Personally, I am sticking with Genesis 1. Wikipedia contributors. Steven A. Benner. Wikipedia, The Free Encyclopedia. August 28, 2013, 14:38 UTC. Available at: http://en.wikipedia.org/w/index.php?title=Steven_A._Benner&oldid=570537446. Accessed October 3, 2013.